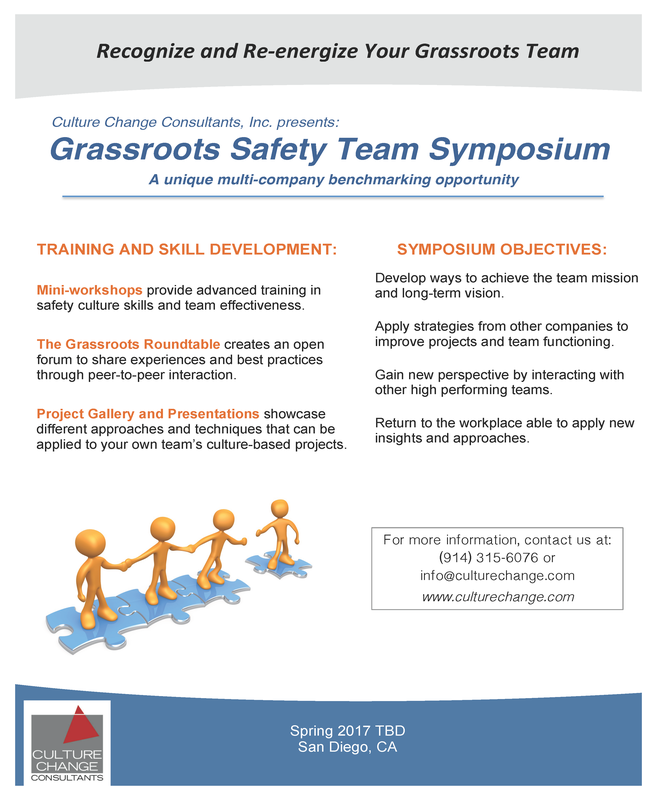 The Grassroots Safety Team Symposium is intended to bring together the best Grassroots Team from each company or each site so that the “best of the best” can truly share “best practices” with each other. Selecting the “best” grassroots team at your site can be challenging. It is recommended that the Guidance Team confer this special recognition upon the grassroots team that scores highest on the following criteria. Key #1 Meeting Attendance: Teams meeting consistently to achieve their goals. Key #2 Culture-Based Project Implementation: GST follows the 7-Step project planning process when developing their projects. Key #3 Relationship Support and Connection to the Guidance Team: Evaluation of the relationship that the GST holds with their respective Guidance Team. To include the ability to request support and coordinate efforts. Key #4 Meeting Effectiveness: Meeting effectiveness as it relates to agendas, discussion topics and effective use of time invested. Key #5 Professional Development: Overview of the members, especially the development with cultural tools and leadership skills. Possible promotions based on the value they have provided to the organization within their cultural roles. Using these criteria will ensure that the teams who attend the Symposium have demonstrated excellence in terms of team functioning, successful culture-based projects and positive support and connection to one another. Specifically, it is the grassroots team members who attend. The team’s Coach and the site Process Champion are also welcome. Teams in their first or second year with a couple of successful projects. Mature teams with a few original members and multiple projects. Coaches looking to further their skill development individual team members representing a team or on a team with new members. Check out past participant testimonials to learn more about the symposium.